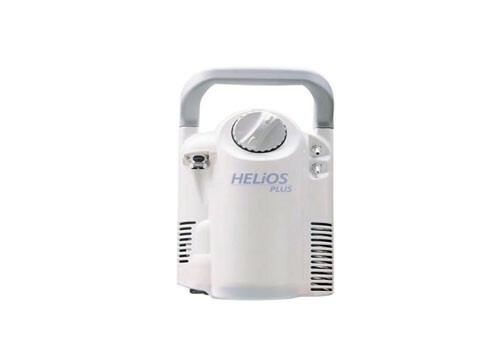 HELiOS Liquid Oxygen | Helios LOX - H850 - H500. Plus Portable Liquid Oxygen, 308 Liters - Each - SHIPS FREE! Marathon Portable Liquid Oxygen, 685 Liters - Each - SHIPS FREE! A Liquid Oxygen (LOX) System consist of two separate parts. 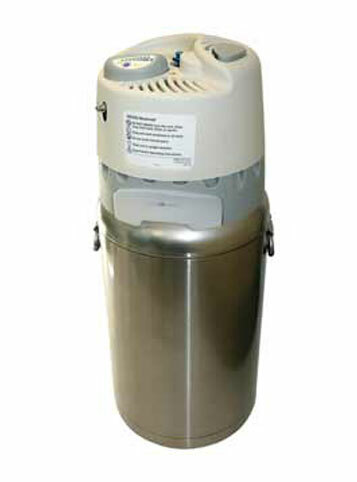 A base station for home oxygen and a lightweight portable unit that is carried by the oxygen patient. 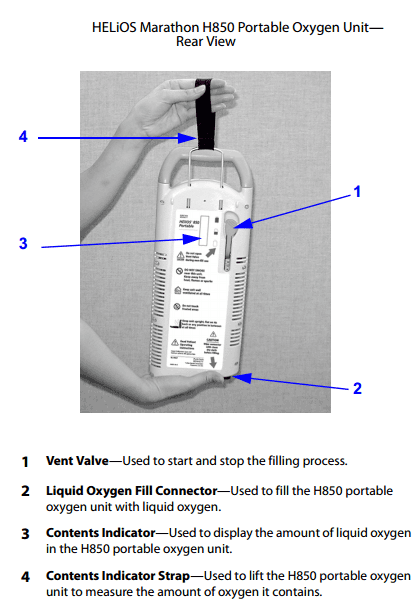 In addition to supplying oxygen for the patient when at home, the base station provides a resupply source for the portable units. 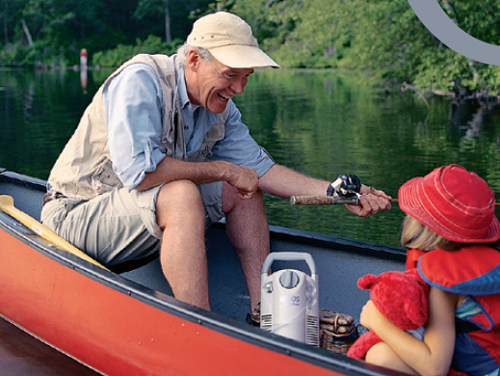 Combined, these two devices offer oxygen therapy that has been found by research to offer the best therapy outcomes. Click the following for more information and resources about LOX Therapy. 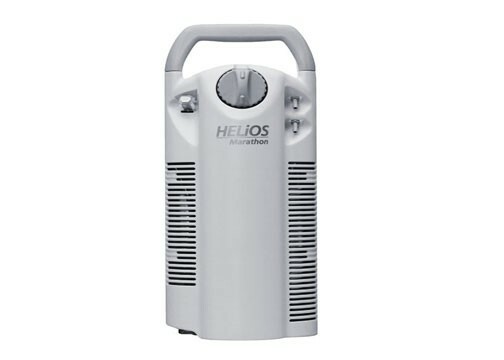 Below are product descriptions for the HELiOS portable LOX units and the base station that you can add to your cart and purchase at the top of this page. You may also view and purchase Helios Accessories Here. 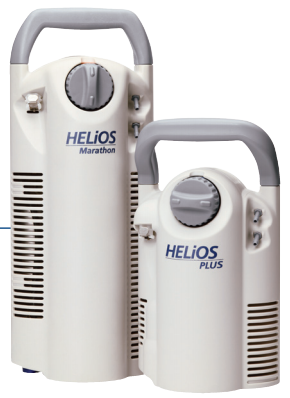 HELiOS Plus and Marathon Liquid Oxygen portable units prove that big things come in tiny systems. In one corner, weighing 3.6 pounds and providing 308 liters of oxygen is the Plus. In the other corner is the Marathon, weighing 5.6 pounds and providing 685 liters of oxygen. 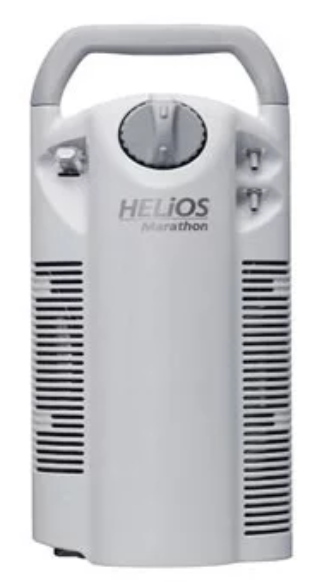 When completely filled, the HELiOS Plus and Marathon can provide anywhere from 10-20 hours of battery- and electricity-free oxygen therapy (depending on model and setting). The wearable HELiOS Plus and Marathon devices provide hands-free solutions for your supplemental oxygen needs. 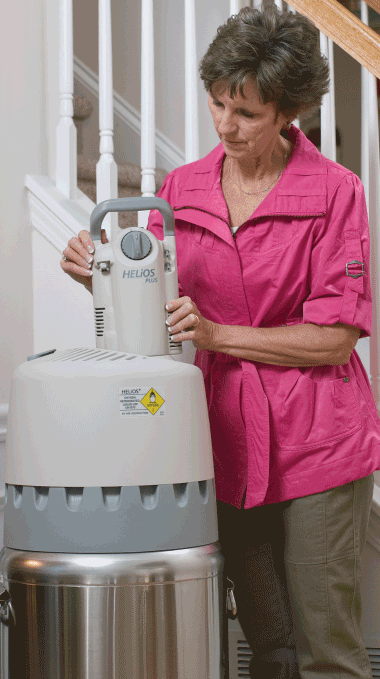 Developed by CAIRE Inc., the HELiOS Personal Plus Liquid Oxygen System stands just 10.5 inches tall and provides up to 10 hours of worry-free oxygen therapy -- no need to carry additional batteries or search for an AC power outlet. 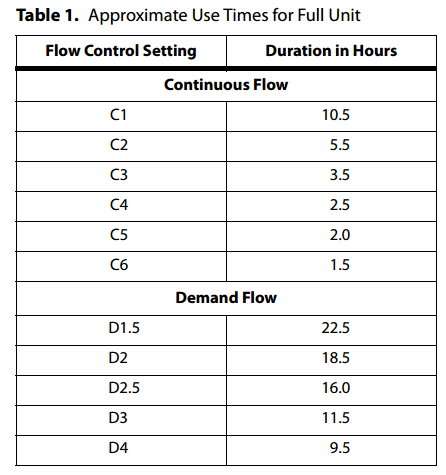 HELiOS Plus operates in continuous flow up to 6 LPM; it provides up to 4 LPM in demand flow -- making it the industry's smallest unit to do so. 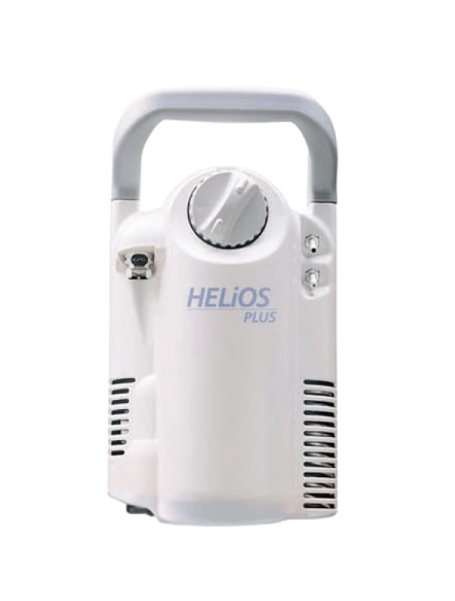 The low-pressure HELiOS Plus (22 PSI) can be refilled via the stationary HELiOS LOX Home Reservoir for Liquid Oxygen Therapy. 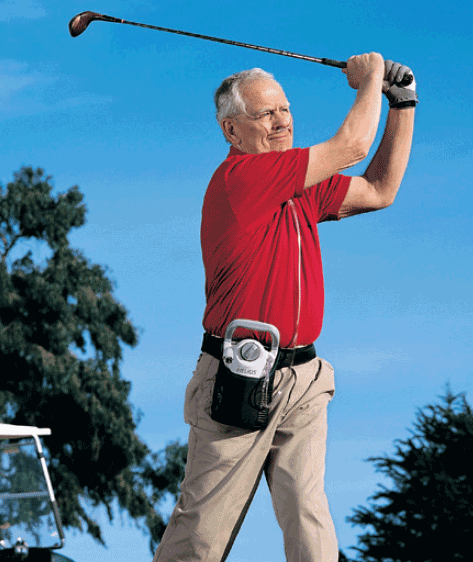 Once refilled, Plus weighs just 3.6 pounds -- ideal for wearing via shoulder or belt strap. 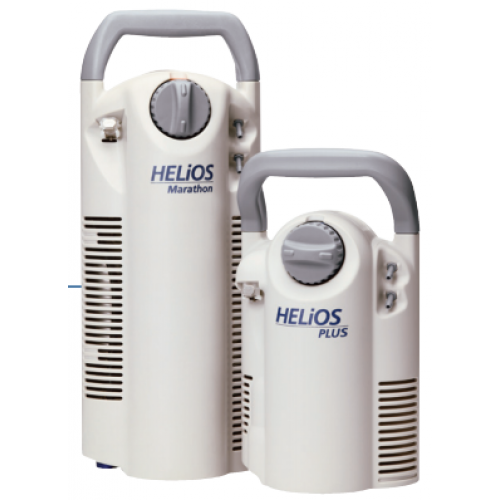 Aptly named, the HELiOS Marathon Liquid Oxygen System provides up to 20 hours of oxygen therapy at a demand flow setting of 2 and up to 5 hours at a continuous flow setting of 2. Only 15 inches tall and a paltry 5.6 pounds when refilled with the HELiOS LOX Home Reservoir for Liquid Oxygen Therapy Marathon is ready for whatever the day may hold. To get the most out of the extended operating hours, Marathon may be toted with a shoulder strap or placed and worn in an optional HELiOS waist pack or backpack. Select between two reservoirs--the HELiOS U36 or the U41. 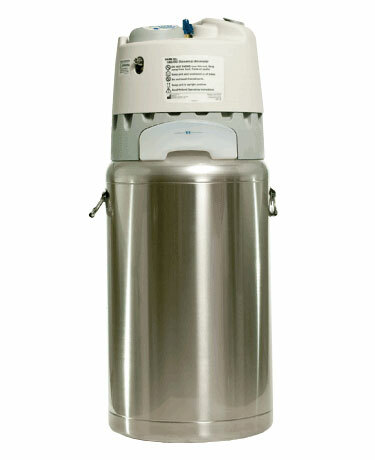 The U36 stores up to 85 pounds of liquid oxygen while the U46 holds up to 110 pounds. Both models have a diameter of 15.4 inches and differ in height by only 4 inches. They may be used for in-home oxygen therapy and for refilling the portable units discussed above. Both are designed with a low-loss evaporative control system to minimize gas loss. HELiOS U36 Home Reservoir is a smaller storage device that offers greater portability. When full, it weighs about 40 pounds less than the U46. It stores up to 85 pounds of oxygen. 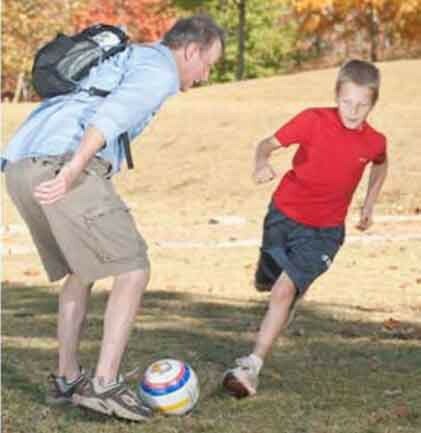 When providing oxygen therapy at 2 liters per minute (LPM), it lasts for approximately 10.9 days. It is designed with a low-loss evaporative control system to reduce the loss of oxygen to a minimum. Weight when empty: 53 lbs. Weight when filled: 138 lbs. HELiOS LOX U46 Home Reservoir is the larger of the two liquid oxygen reservoir options. It weighs about 7 pounds more than the U36 and can store 8,847 additional liters of oxygen gas. It provides approximately 3 additional days of oxygen at 2 LPM volume. Weight when empty: 60 lbs. Weight when filled: 170 lbs. Caire HELiOS Liquid Oxygen Brochure outlines continous oxygen flow and the HELiOS Marathon and the HELiOS Plus. HELiOS Liquid Oxygen Trifold discusses the benefits of oxygen therapy and the role of liquid oxygen. HELiOS Reservoirs presents details for the U36 and U46 liquid oxygen reservoirs. 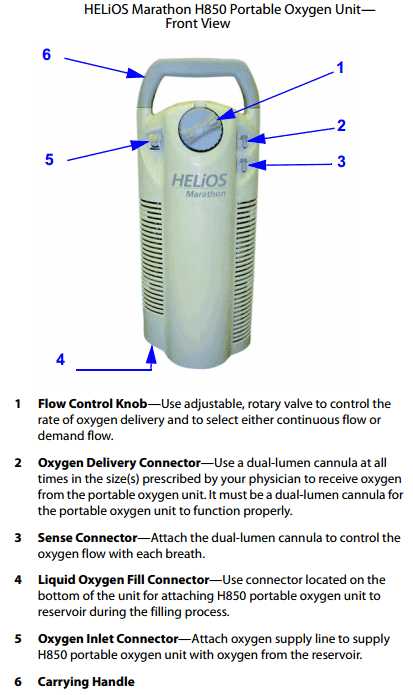 User Manual offers information on the use of the HELiOS and accessories. Operations Manual for the Plus (H300) and Marathon (H850). HELiOS Troubleshooting Guide lists potential problems and solutions to keep your liquid oxygen functional. HELiOS Accessories find backpacks, hip packs, portable carts, reservoir rollerbases and more! AirSep HELiOS LOX Warranty provides information regarding product warranty and repair. 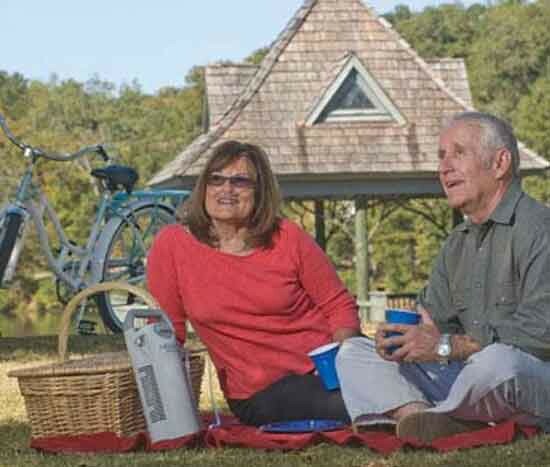 Many oxygen therapy patients are seeking the best solution for their individual needs. 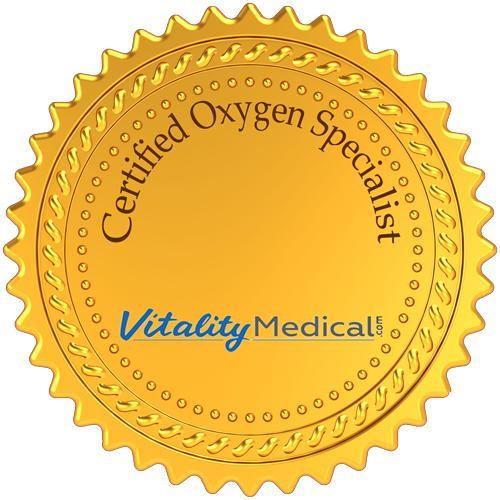 Vitality Medical has Certified Oxygen Specialist standing by to answer your questions. 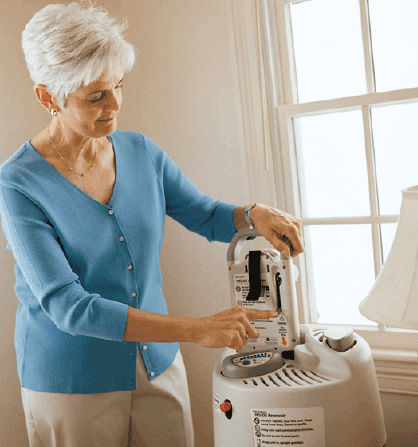 When you call about liquid oxygen systems or home and portable oxygen concentrators, you will be connected with a Vitality Medical Certified Oxygen Specialist. 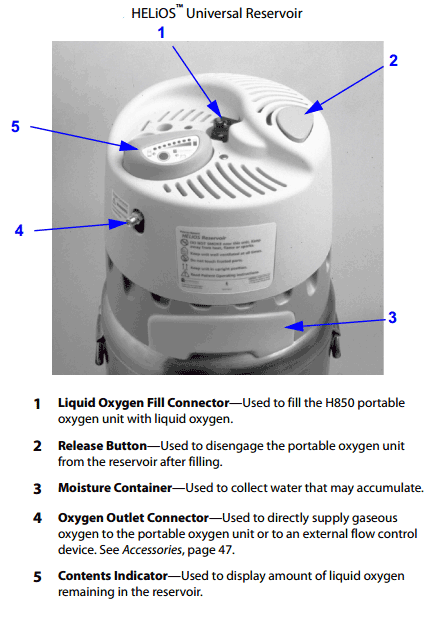 Oxygen Therapy Devices are life-essential devices. This is why Vitality Medical's founder, a Registered Nurse, heads a cross-company oxygen committee. This committee created an oxygen specialist certification curriculum. To certify, one must pass a proctored, 50-question exam in 35 minutes with a score of 94% or better. Furthermore, our Specialists must recertify every six months. Technology in oxygen therapy is fast changing. New products are being introduced often. Talk to someone who is trained in the latest products and their capabilities. Learn more about our Oxygen Expertise. Vitality Medical is an authorized retailer of CAIRE products which include the AirSep O2 Concentrators, SeQual, HELiOS and Companion LOX. 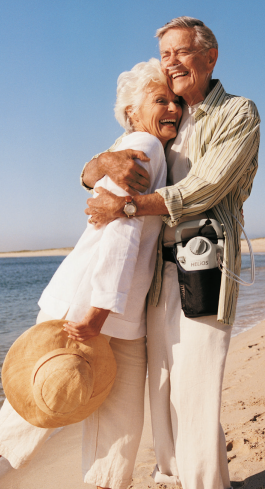 For compliance with current FDA regulations, we require a prescription for select Portable Oxygen Concentrators, Home Stationary Concentrators, and Pulse Oximeters. Prescriptions are not required for replacement parts and accessories. If a prescription is required for an item in your order, we will inform you of the requirement and ask you how the prescription will be provided. How do I submit to Medicare for the 80% they cover. I also have co-insurance for the other 20% Covered. Approved for both. We do not work directly with any insurance companies because we are an online retailer. If you are looking for reimbursement, you will need to place the order through our website and then call your insurance agency afterward. Is there a source for the carry case, which is broken? Or should I contact my Oxygen supplier and just get a new complete unit? If the carry case falls to disrepair and is under warranty you may be able to file a warranty claim. It's best to contact the manufacturer for information. Like the face that I can use for continuous flow when I exercise and pulse when I'm stationary. Just need to add a carrying bag, but the handle is very convenient. Have been using this model for over five year. I've dropped it a number of times, but it just keeps "ticking." Bought a second one to extend my endurance. The Helios liquid oxygen has a very low weight even when filled and yet last all day for me. 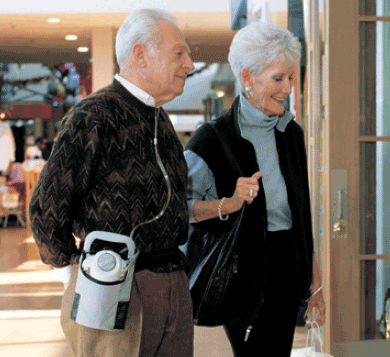 Oxygen concentrators would run out of battery life way before the end of the day. I am a new convert to liquid oxygen and love the new freedom this offers me.